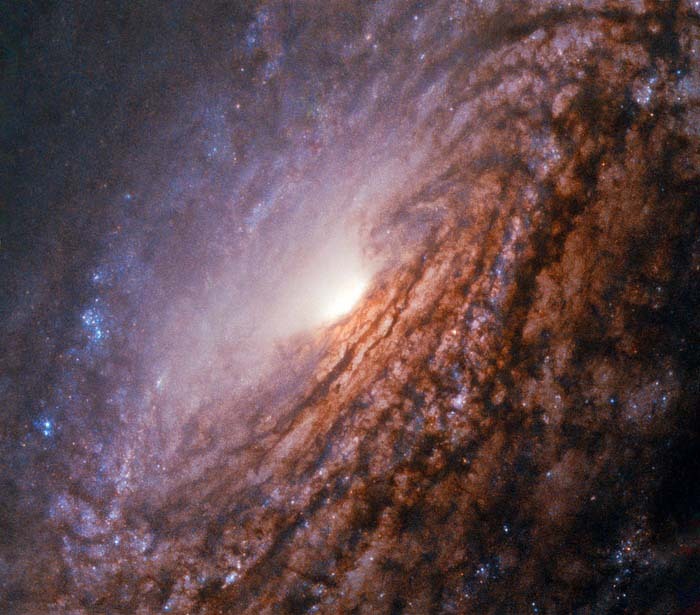 This Hubble Space Telescope image shows the unbarred spiral galaxy NGC 5033, located about 40 million light-years away in the constellation of Canes Venatici (the Hunting Dogs). The galaxy is similar in size to our own galaxy, the Milky Way, at just over 100,000 light-years across. Like in the Milky Way, NGC 5033’s spiral arms are dotted with blue regions, indicating ongoing star formation. The blue patches house hot, young stars in the process of forming, while the older, cooler stars populating the galaxy’s center cause it to appear redder in color. In contrast to the Milky Way, NGC 5033 is missing a central bar. Instead, it has a bright and energetic core called an active galactic nucleus, which is powered by a supermassive black hole. This active nucleus gives it the classification of a Seyfert galaxy. Due to the ongoing activity, the core of NGC 5033 shines brightly across the entire electromagnetic spectrum. This released energy shows that the central black hole is currently devouring stars, dust and gas getting close to it. As this matter falls onto the supermassive black hole, it radiates in many different wavelengths. While its relative proximity to Earth makes it an ideal target for professional astronomers to study its active nucleus in more detail, its big apparent size in the night sky and its brightness also make it a beautiful target for amateur astronomers. This entry was posted in Nature, Photography, Science. Bookmark the permalink.